As we all know that Guru Nanak Dev ji was a great saint and the first guru of Sikhism. He was also the founder of Sikh religion. This story based on one of the true events in his life. The objective of the story is 'The honesty is the best policy' for everyone to live a peaceful and respected life. We should tell this type of inspirational stories to our kids so that they should learn good lesson from us and be a good person in future. Guru Nanak Dev ji spread the message of hard work and love everywhere in the world. Any one who came in contact with him learnt the lesson of honesty. Guru ji used to travel various places all over India and other countries. His two companions Bala and Mardana always remained with him and they used to make spiritual bhajans (devotional songs) to let the people understand God, more precisely. He has given the slogan of 'Ek-Onkar', which means 'God is One'. Once guruji and his companions visited in a village in north India where an honest carpenter Lalo and a rich man named Malik Bhago lived. When people heard the new of arrival of Baba Nanak they became very excited and felt privileged to welcome babaji. Lalo, the poor but laborious carpenter, came to see Babaji. He wanted to serve babaji and shown his desire to invite baba ji to his home with true heart. He felt at Guru Nanak ji's feet and said "O Baba ji, I am honored to get your divine presence. I wish to welcome you at my home and want to serve you." Lalo's words were full of love and devotion. Guruji accepted his invitation and went immediately with him to his place. Lalo and his wife served typical meal of that region, with rice, daal and chapattis. The food was very simple but full of love so, guru ji and his companions enjoyed it very much. Guru ji blessed Lalo and his wife and left. Lalo and his wife felt very blessed with the visit of such a saint at their home. In the same village Malik Bhago also lived, who was a very rich. He was the governor of that area. He was proud to be very rich. He had organized a huge festival of please the God. He also heard about arrival of Baba ji in their village. 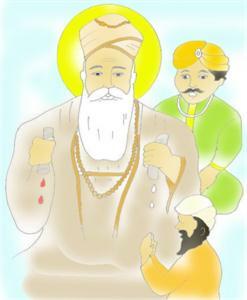 He sent a messenger to Guru Nanak ji to request him to join him in the feast at his home. Guru ji, first denied the messenger but the messenger became afraid and requested to Guru ji, "Babaji, the governor must be angry and might beat me if you won't come along with me to the feast." So Guru Ji went with him. Guru ji, at Malik Bhago's house, instead of eating anything, just sat by himself meditating. Malik Bhago felt insulted and got offended. He asked the Guru angrily, "Baba ji, why haven't you eaten any of this food? You had eaten at the house of a low caste carpenter but not mine. My food is most exotic, delicious and expensive, why won't you eat it?" Guru Nanak replied, "I will show you why." He then asked someone to bring some of the left food from Lalo's home. When the food arrived, Guru ji took a chapati from Lalo's house in one of his hands and a chapati from Malik Bhago's feast in the other hand. He started squeezing the chapatis and something happened, that was really amazing for everyone. Out of the Lalo's chapati, milk came out! It was a miracle. But out of Malik Bhago's chapatti, dropped blood. Everyone was shocked. Malik Bhago asked with surprise, "Baba, What does this proves?" Guru Ji patiently replied, "Lalo's food dropped the milk because it contained harvest of a poor and there was Lalo wife's love and kindness while cooking and serving the food". Guruji continued, "And your food dropped blood because there was hate of your servants for you while cooking food. They are sad and feel pain with the way you treat them. Only food that is made with love is truly good for a human body." Guruji continued, "The food contains good or bad energy in it depending on the mentality of the person, cooking it. If someone cooks and feed with love than food contains good energy, whereas the food cooked under pressure and sorrow and served without love, contains bad energy." Malik Bhago felt in the feet of Guru Nanak ji and requested to forgive him. He became a student of Guru Nanak now. He started to love others and became a fair man. Hating people all year and loving others just once, doesn't make God happy. To get love from others and god one should be fair from his heart for everyone and should give respect to all. For reading more spiritual story of guru Nanak Dev, you can click Guru Nanak Dev Ji and Brahmins and for getting coloring pages for kids you can visit Guru Nanak Hayanti – Prakash Parv". Guru Nanak Dev ji was the first Guru of Sikh religion. He had a great personality and was a true messenger of god. 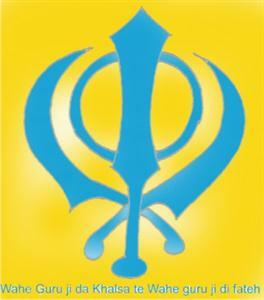 He started Sikh religion and gave a slogan of Ek-Onkar, which means 'God is One'. He did not believed in different religions and casts. He said, "Love and help others and be kind to everyone."